Although the numerous irreconcilable accounts of Thoth’s birth are indicative of the lack of a systematic mythology for him. Siegfried Morenz supports an account that associated him Ra. An ancient passage ascribes Thoth’s birth to the powers of the chief sun god: “I am Thoth, the eldest son of Ra, whom Atum has fashioned; created from Khepri ... I descend to earth with the secrets of 'what belongs to the horizon.’ ” Since this version credited the birth not just to Ra alone, but to Atum and Khepri, other forms of Ra, Thoth was provided with a powerful trio of fathers, and it was significant that Thoth came into the world bearing powerful secrets. While Thoth was viewed as the god of wisdom in general, he was known more specifically as the god of science and medicine, primarily because he was remembered for giving Isis the charms that brought Osiris back to life long enough to father Horus, and that later cured the sick Horus of his scorpion stings. He was also thought of as the source of rhetoric, names for objects, and the alphabet. He invented hieroglyphic writing, arithmetic, and astronomy. Despite these lofty attributes, Thoth could be one of the most amusingly and charmingly down to earth of the gods. He was slow and garrulous when Isis needed him to cure Horus’ stings. He was as confused as any of the other gods during the trial of Seth and Horus. On the other hand, he was fierce and bloody in the defense of any of the gods he thought wronged. Much of Thoth’s authority over men and gods came as a result of his being appointed deputy to Ra. We have seen that when Ra became tired of the burden of all his work, he delegated some of his duties to other gods and appointed Thoth his assistant: “Inasmuch as I shall act so that the light may shine in the underworld ... you shall be scribe there and keep in order those who reside there and those who may perform deeds of rebellion against me .... You shall be in my place, a place-taker. Thus you shall be called Thoth, the place-taker of Ra.” Thoth was also the heart of Ra, which means that he was Ra’s source of wisdom, and he had his place in the solar boat, where along with Maat, he set the course each day. Ra gave Thoth the moon to balance Ra’s own sun. As a moon god, Thoth used his knowledge of mathematics to measure the seasons and regulate time. He surveyed the heavens and planned the shape of the earth; it was his will that kept the earth and everything on it in equilibrium. The universe’s stability depended on his knowledge of celestial mathematics. These attributes led him to be considered the god of science. 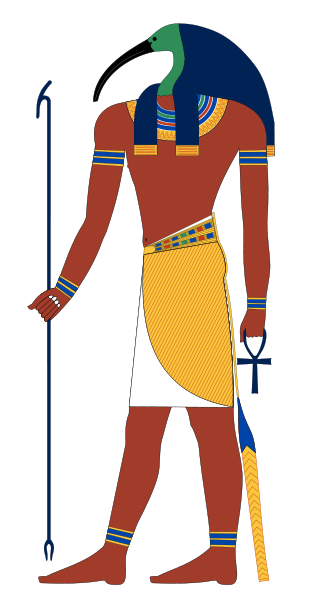 The wide powers of Thoth involved him in numerous duties in behalf of both humans and gods. The oldest surviving references to Thoth are found in the Pyramid Texts, in which he was assigned a role in the underworld. He was to ferry the dead across the “winding waterway” on his wings. Once in the underworld on the other side of the water, he became a champion of the dead king and protected him from those who would does him harm? Later, many of the vignettes in the Book of the Dead gave him further underworld duties, standing beside the scales at the trial with a quill in hand to record the verdict on a papyrus scroll. In another role Thoth was considered protector and messenger of the gods. He was expected to sharpen his knife and cut out the hearts and remove the heads of those who would do harm to god or king. His specific duty was to protect the Eye of Horus and see that it was conveyed to the king as he sought immortality- Additionally, he was to protect justice and assure peace. The Pyramid Texts contain a prayer to him as peacemaker “Hear, 0 Thoth, in whom is the peace of the gods.” One of the spells in the Coffin Texts claims he was the “Bull of Justice,” able to satisfy even Horus and Seth, in whose struggles his role as peacemaker among the gods was most evident. In order to fulfill these and other duties, Thoth invented the craft of writing, perhaps to the modern mind his most appealing contribution to learning. He kept written records of the seasons and celestial geometry; he was responsible for keeping the records of judgments on the dead and for writing letters on behalf of the gods at Heliopolis. This function was described in the Book of the Dead: “I have brought the palette and the inkpot as being the objects that are in the hands of Thoth; hidden is that which is in them! Behold me in the character of a scribe.” It is interesting that even his ability as a writer involved hidden knowledge, but Thoth’s use of this art went far beyond performing secretarial services for the gods: he was also Heliopolis’ chief author. At times he was considered to be the author of the whole Book of the Dead, but more widely he was thought to have written only sections of it. One late papyrus claimed that Thoth wrote parts of the Book of Breathings “with his own fingers,” and through this enabled souls to breathe for ever. His most ambitious writing project was called the Book of Thoth and contained his magic formulae, although the length of this book remains a matter of controversy. One version of the myth claimed only two pages for the book one dealing with magic to charm nature, and the other giving the magic to control the world of the dead. Another version of the myth claimed that there were forty-two books dealing with law, education of priests, history of the world, geography, hieroglyphics, astronomy, astrology, religion, and medicine.